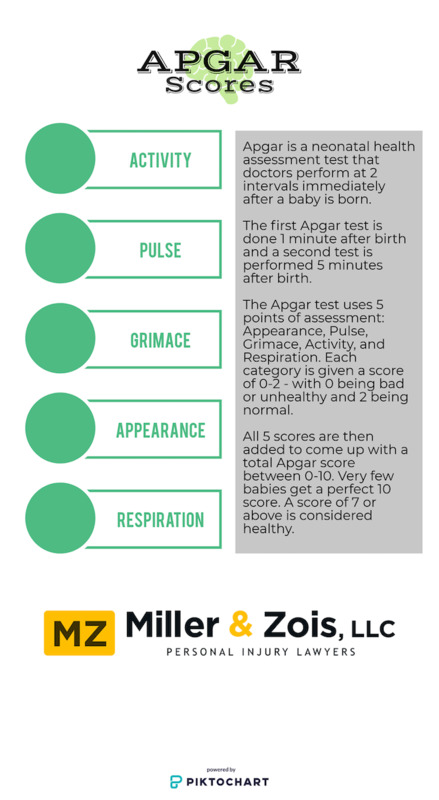 The Apgar Score, devised by Dr. Virginia Apgar in 1953, is a quick method for assessing the clinical status of a newborn. Five features are scored at one minute and five minutes after birth. The features are respiratory effort, heart rate, color, muscle tone and motor reactions. The most critical features are the child's attempts to breathe and the infant's heart rate. In general, if these two are satisfactory, the other features are as well. Each feature is scored from zero to two, making a total of 10 possible points. A low total score of zero to three, which will occur if the baby does not breathe or if the heart rate is too slow, means the child needs urgent resuscitation. A score of seven to 10 indicates a well baby. A score from four to six is a cause for concern, but obviously it is not a serious as a lower score. The Apgar score is a reliable indicator of acute infant health at birth and has been demonstrated to be correlated with birth injuries and deaths. APGAR scores are sometimes used as an element of proof to common malpractice claims against obstetricians: oxygen deprivation (hypoxia) and neurological damage among infants. But my commonly you see the defense lawyers claiming that a good minute Apgar score means that baby's diagnosis of hypoxia or cerebral palsy could not be caused by a brain injury during childbirth. So if the child's Apgar score at five minutes is six or above, the defense lawyer will try to find experts to say that the child's brain injury could not have been caused by an OB's mistake during labor and delivery. This argument often falls apart quickly. First, bias comes into play in a lot of these. Health care providers have a bias towards a higher score. Interobserver reliability low, even at five minutes. Sometimes this bias is impossible to discern. In other cases, a review of the raw scoring will show that the scoring does not even correlate with the objective numbers. Also, there are often factors that can artificially inflate a baby's five minute Apgar score. The nature and extent of neonatal resuscitation can play a big factor. Assessment of a child's respiratory effort -- a big factor in the score -- is compromised when breathing assistance is given. Low Apgar scores can be the result of mistakes during the birthing process by the obstetrician or the nurses. Often these error cause oxygen deprivation that can cause permanent injuries that require a lifetime of care. If you suspect that your child may have had poor care during the childbirth, call our birth injury lawyers at 800-553-8082 or get a free online consultation.